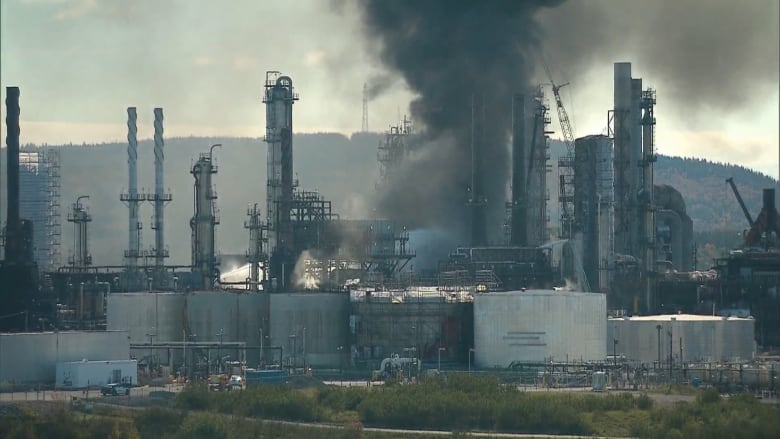 Eight hours after an explosion and fire at the Irving Oil refinery in Saint John shook the city and sent several contractors to hospital with non-life threatening injuries, the situation has been stabilized, Emergency Measures Organization officials say. "EMO is no longer recommending that area residents shelter in place," the organization posted on Twitter shortly after 6 p.m. AT. The New Brunswick Department of Environment and Department of Health are monitoring air quality around the east-side refinery and "have not identified any concerns to public health," it said. The unit, which removes sulphur from diesel, has been isolated and the rest of the refinery has been shut down "out of an abundance of caution," said Irving Oil's chief refining and supply officer Kevin Scott. The Irving Oil facility is the largest refinery in Canada. It employs about 1,400 people and is capable of producing more than 320,000 barrels per day. Irving Oil is working with WorkSafeNB, the Department of Environment and EMO officials to "understand what happened" and determine next steps, said Scott. The company hopes to avoid any interruptions to service, he added. "We're working through all of our contingency plans in terms of supply. Of course we have finished product in tankage at the refinery and then further out in the system in marine terminals and you know relationships with other suppliers as well that we will draw on to minimize the impact on any of our customers — in Canada or the U.S."
Several streets were closed but no evacuations were ordered. EMO was reporting four people were treated in hospital for "minor injuries." Darling said on Twitter early after reports of the explosion emerged: "This is obviously a live event ... when we know more, you'll know more. Praying for the safety of all involved." Premier Brian Gallant tweeted he has reached out to the mayor. Gallant said the New Brunswick Emergency Measures Organization was engaging with the city and Irving Oil officials to assess the situation.